Finally came to process some images I made after my satellite observing session of September 1st. 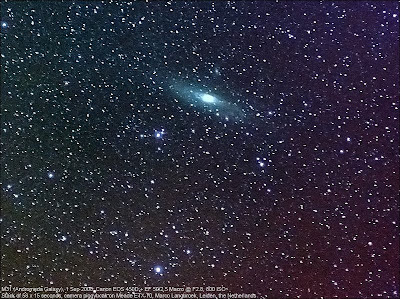 Stacking 58 images with an exposure time of 15 seconds each, resulted in the image of M31, the Andromeda Galaxy, below. The camera (Canon EOS 450D @ 800 ISO) was mounted "piggyback" on my small Meade ETX-70, the lens was the EF 50/2.5 Macro @ F2.8 which I also use for the satellite pictures.